Ora Ayal (1946-2011) was born in Jerusalem. She studied at the Bezalel Academy of Art and received a degree in mathematics from the Hebrew University of Jerusalem. Ayal created games, stories, and activities for teaching elementary-level math. She also translated adult and children`s books from Italian into Hebrew. 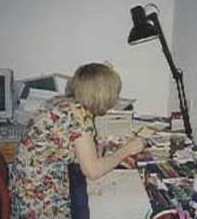 Ayal wrote and illustrated eight books for children and illustrated over 100 books. She was awarded the Israel Museum Prize for Illustration (1994).